A great passion for the sea, passed down from generation to generation, a careful selection of raw materials, manual processing within a few hours from fishing, this is a brief strategy of Rizzoli Emanuelli SpA. The company is a family business founded in Parma in 1906 and led by President Antonio Rizzoli and by Massimo Rizzoli the CEO. The cutting edge is given by the characteristics of the packaging thanks to modern technologies. The flexible packaging, created through practical packaging is easy to open and to maintain the freshness of the product. Packaging with a transparent window allows the consumer to fully evaluate the product before purchasing. Great attention is also given to internationalization and many investments are made for R&D. The special recipe for the Anchovy Fillets in Spicy Sauce, characterized by a sweet and sour taste was handed down by Rizzoli family recipes by word of mouth over a hundred years ago. 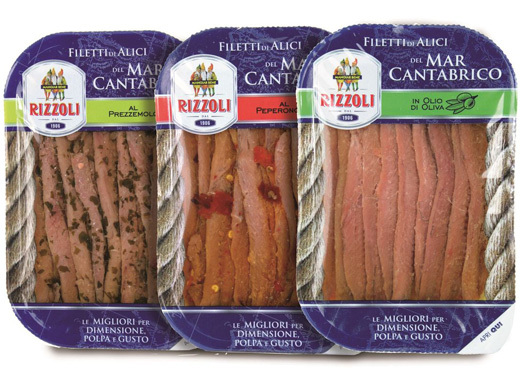 The range of the company also presents a wide selection of anchovies, tuna and mackerel in different lines designed for domestic consumption and for the catering sector. There are two new products, both derived from the technique of sustainable fisheries using ‘circle hook’ fishing: the anchovy fillets from the Cantabrian Sea, aromatic and flavorsome and available in three flavours - olive oil, parsley and chilli and the Adriatic Sea Rizzoline. The fillets are processed within few hours from fishing and put in 70g practical transparent plastic packaging. The Rizzoline from the Adriatic Sea are anchovy fillets presented in three flavors - olive oil, capers and olive oil and parsley and chili. They are packaged in flexible transparent packs, strictly in Italy and have obtained the Italcheck certification, a patented system that certifies the authenticity of the Italian product. All production facilities, located near the places where the fishing takes place, like Croatia, Spain, Morocco and Tunisia, have the BRC-IFS v.6. and ISO 22005: 2008 certifications and adhere to the policy 'Friend of the sea', for the protection of fish stocks, the seabed, and 'Dolphin Safe', to prevent the accidental capture of dolphins while fishing.